The star of Buying Food is Henry Slinkman. Good ol' Henry went to the store to buy something for dinner, and his wife told him to just get whatever looked good. Instead of buying Steak-Umm like a normal person would/should, he buys three pints of oysters, two rutabagas(simply because it looked unusual), and a cake. To the surprise of no one, most of the food was thrown away. 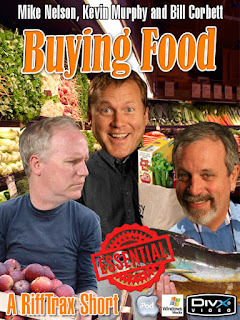 The rest of the short is about how to be smart with your grocery budget. This riff is one of my favorites. There's just something special about it. I laugh and laugh every time. Maybe it's the feigned incredulity of they guys when the narrator mentions that food with a better grade is better quality. Maybe it's all the stuff with Henry. I'm not sure, I just know I love it. Buying Food gets five stale cakes out of five, and is a PB&A Essential.